William 'Whacker' Atkinson celebrates 50yrs in WSAA. THE president and longest-serving member of Whitby Sea Anglers Association was honoured at the club’s presentation evening on Good Friday. After 50 years with the association 67-year-old William “Whacker” Atkinson has lost none of his competitive nature and said: “As long as I can get down them cliffs I will still be fishing. Pictured at the presentation evening he received a framed Sutcliffe picture and companion Ann Heron also received a bouquet of flowers. Mr Atkinson joined the club aged 16 in 1962, but achieved his first victory in 1965 by setting a new club record of 135lb. He would establish himself as a top angler throughout the following decades, when he finished in the top three for 18 years in a row, twice breaking the club record. He was club champion nine times and in 1976 caught his heaviest fish, an 18lb 9oz cod. “There’s no secret to angling, its just a matter of upping your game,” he explained when asked how he managed to achieve repeated success. “You’ve got to think of how to improve things all the time. “Saltwick Bay was my favourite fishing place but there’s nothing there now. The first stretch of water that Mr Atkinson ever fished, aged just 10 years old, was Glaisdale Beck, where he caught trout and eels. However, he soon began to look further afield in search of bigger challenges. “I decided to have a go at sea fishing and the first fish I caught was a flatfish”, he said. Despite occasionally venturing out on boats to fish, it has always been onshore angling that Mr Atkinson has enjoyed and he said: “In a boat it’s not the same. In the 1970s and ‘80s WSAA fished in the Northern Federation League and Mr Atkinson was a major part of this team, along with Denis Thompson, Dave Perrett and Ian Russell. They would win the league three times and the team still holds the federation record with a total weight of 86lbs. Throughout his life Mr Atkinson has been known to friends as ‘Whacker’, a monicker he gained while still at school. “I was a little lad at school, but I used to bash them all,” he said. After leaving school he worked in farming, construction and then on oil rig sites on the moors, but explained what drew him to angling throughout all this time. In 1997 he won the All-England Codling Championship and in 2005 became the only Whitby angler to win both Whitby opens in the same year, but he explained that he has seen many changes throughout the half century he has been with the club, and not all of them have been positive. He added that anglers have also seen the evidence of overfishing for commercial purposes: “Fish are getting scarcer every year, by a long way. “Once I had three fish for 40lbs in three quarters of an hour, you don’t get that now. In 1978 Mr Atkinson became chairman of the association and he was appointed president in 2011. 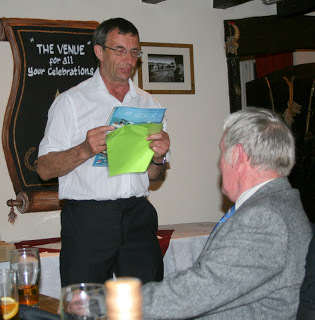 At his presentation Dave Johnson gave a full history of all Whacker’s achievements as a club fisherman. Bernard Vasey gave a presentation of all the press clippings Whacker, was in, throughout his competitive career. Whitby Gazette 15th April 1976 (price 6p). Mr William Atkinson, of 30 Stakesby Road, Whitby, with his record breaking cod of 18 lb 09 1/2 oz. It was caught on hermit crab on January 14th from the beach in the vicinity of the Creta Block between the east pier and Saltwick. The fish is a club record. 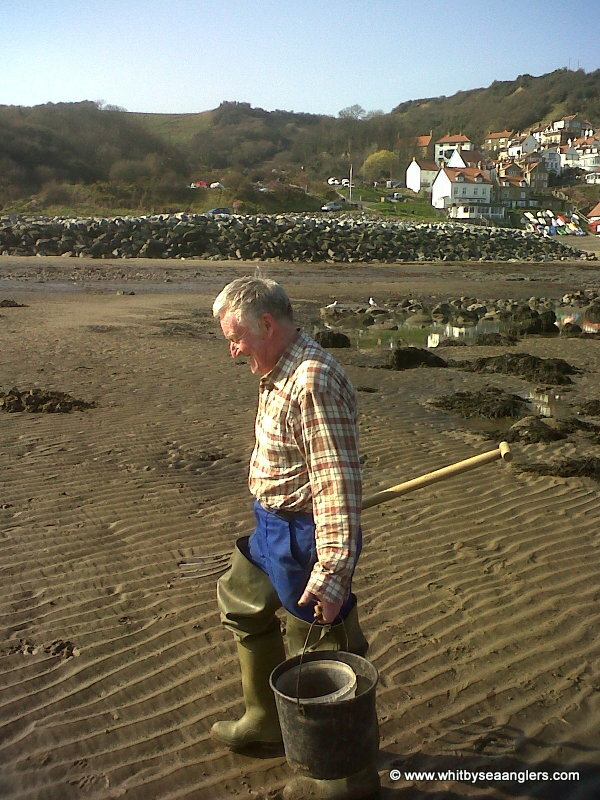 William Atkinson at Runswick Bay 12th March 2012, photograph by Peter Horbury.